Happy Monday! 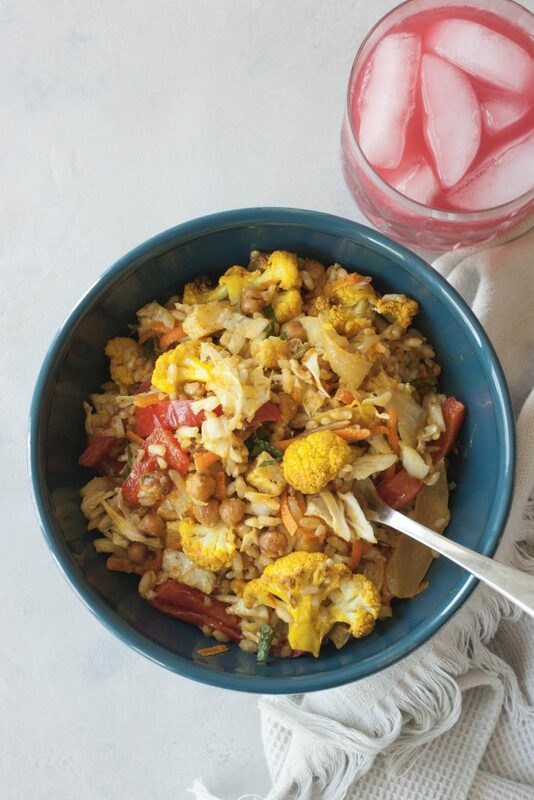 After an beautiful weather and a great weekend I’m even more excited to bring you this Curry Cauliflower Grain Bowl for Meatless Monday. The only thing that could have made the weekend better is if S was playing in her big soccer tournament but she was there to support her team and is hoping to get cleared to play tomorrow, fingers crossed. It was still a wonderful weekend, although very busy, and as we go into this last week of school for the girls I’m looking forward to having them home for the summer and hopefully things settling down a little next week. Really though who am I kidding because next weekend we have another soccer tournament and we are racing the clock trying to get our garden finished up this week. It’s crazy times like this that have me needing healthy comfort bowls like this one that are packed with nutrition and anti-inflammatory turmeric and ginger. Just over a month ago A and I went to a new place to eat here and it was love at first bite, for both of us! I got a curry bowl and it left me speechless. Since then I’ve been there 3-4 more times, brining everyone there as an excuse to go back, and each time I can’t bring myself to try anything else. If it was closer I’d be there more often but it’s probably a good thing it isn’t for a few reasons. Of course I had to recreate the bowl at home, but I did make one minor tweak. Instead of citrus glazed tofu I decided to make it with Crispy Roasted Chickpeas. Since cutting out soy I tried to add it back in there and there usually having it no more then once a month, and usually not even that often. Well with this bowl I clearly was eating it more than once a month with all the trips so I decided to make the tweak, although it’s also delicious without tofu or chickpeas. There is so much to love about this bowl and so much packed in, not to mention it has turmeric and ginger which I can’t get enough of lately. It’s really a nutritional powerhouse packed with so many vegetables and whole foods. It might seem like a lot of work with so many things going on but it’s really easy and a great one to make ahead as it’s delicious hot or cold. I roast all the veggies in the oven, at the same time as I’m cooking the rice and sautéing the peppers and onions. If adding the Citrus Roasted Chickpeas I try to fit those on with the jicama or make those before or after. I like to also make my own curry seasoning but this is great to use on lots of veggies and it’s used in the roasting the cauliflower as well as in the Ginger Curry Dressing. You also don’t want to forget the fresh mint, it really makes the dish with the curry seasoning it’s an explosion of flavor. 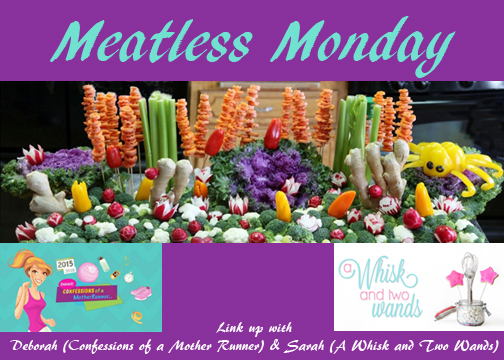 Thank you for joining my co-host Deborah and me for another Meatless Monday! I hope you are inspired by one of the many recipes below. *This salad can be served warm or cold and is a great recipe for meal prep and making a head, cooking up all the ingredients ahead of time and throwing together or putting the salad together and enjoying over a few days. If prepping I don’t shred cabbage or carrots together until just before to keep crispness. Start by making the dressing, whisking or shaking all the ingredients together in a glass container with a tight fighting lid. Place dressing in the refrigerator. Preheat oven to 425F. Line 2 rimmed baking sheet with foil and set aside. In a large bowl toss cauliflower with 2 tablespoons of olive oil. Sprinkle in curry seasoning and toss. Spread cauliflower on baking sheet and wash your hands. Sprinkle generously with sea salt and pepper. In a bowl toss jicama with 1 tablespoon of oil and spread on the other foil lined baking sheet. Bake cauliflower and jicama for about 30-45 minutes, checking at 30 minutes. If you have room for roasting the optional chickpeas you can also make them at the same time, rinse and drain the chickpeas well and mix with oil and honey. Spread chickpeas evenly on a baking sheet and bake for 30-45 minutes, until golden brown. While the veggies are cooking cook rice according to package instructions. You can also sauté peppers and onions at the same time. Heat 1 tablespoon of oil in a large skillet, add peppers and onions and sauté, about 10 minutes. If making chickpeas when they are done let cool for 5 minutes before tossing with orange zest and sea salt. Let veggies and rice cool for 5 minutes. 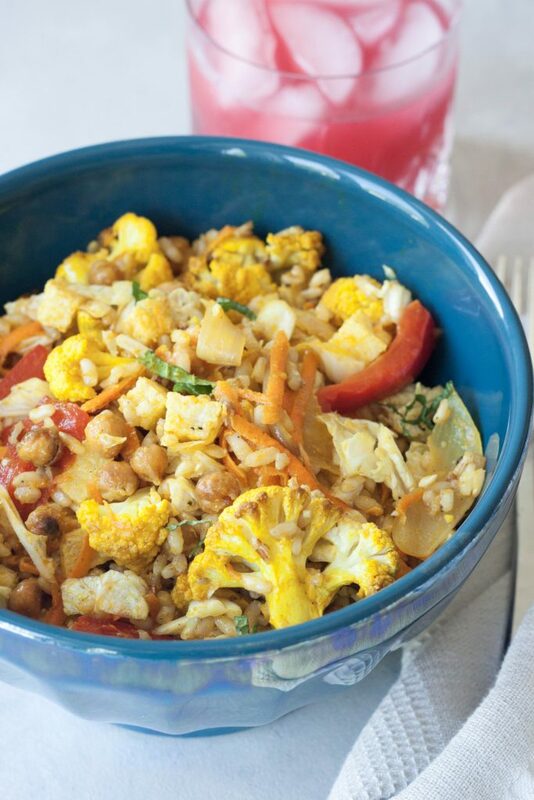 If serving warm in a large bowl toss together rice, jicama, cauliflower, optional Citrus Roasted Chickpeas, and peppers and onions. Add shredded cabbage and carrots, tear mint leaves into pieces add and toss. Shake dressing and pour over the salad, toss together, and enjoy! If prepping ahead and eating within the next 24 hours you can mix it all together and store in an airtight container or for best texture or if you will be eating in a couple days store everything in airtight containers in the refrigerator and toss it all together just before enjoying, see note above. Enjoy! I’ve been loving roasted cauliflower so much in the past year. Can’t wait to see yours! Roasted veggies are the best. These seem like they might take a long time but the end product looks worth it! It seems like that but I roast it all at the same time and while that’s going cook the peppers and onions and the rice so it all comes together pretty quick. I also like to make it ahead in batches and throw it together and mix things up with the rest if I roast a bunch. It’s so worth it! Curry is one of my favorite things ever and SO comforting on rainy days! It really is! Shh don’t mention rain! I love the simplicity of your curry seasoning, and that ginger curry dressing is fantastic! Pinned for later, thanks! 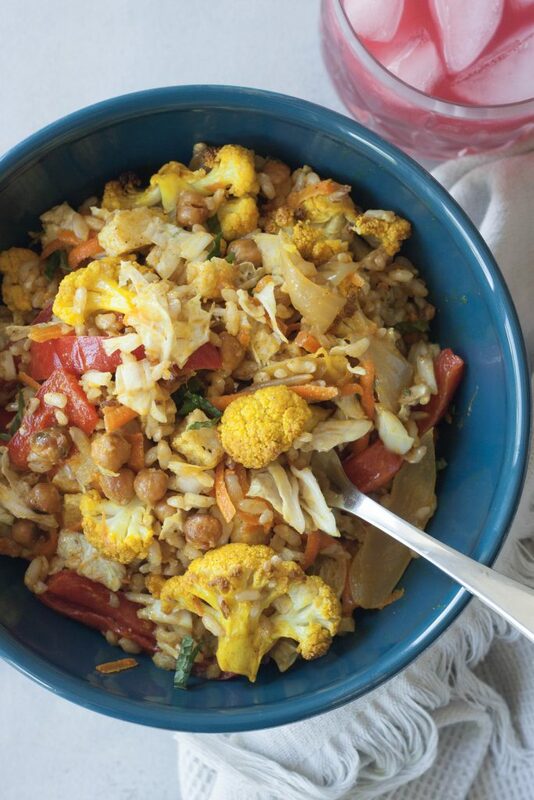 Love me some curry… this looks delish! This looks so amazing. 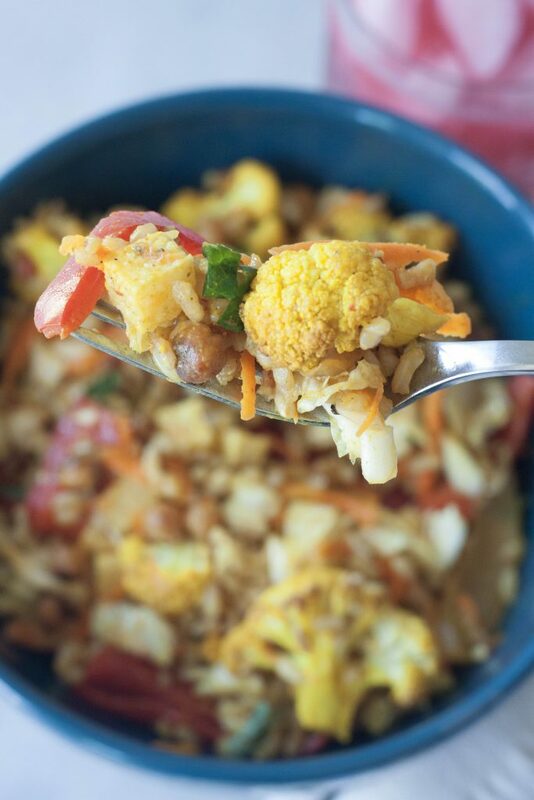 Cauliflower is my favorite veggie so this has my name written all over it! Thank you! I’m slightly obsessed with roasted cauliflower! “Nutritional powerhouse” is exactly how I would describe this bowl too! Loving all the goodness that’s packed in here! I could eat this every night! Thank you, it really is packed with nutrition and flavor. I know the feeling I could eat it every day and it’s why I was driving to get it for lunch all the time. Grain bowls are one of my favorite dishes! This one looks delicious and nutritious! I love easy bowls like this … but especially like how you have multiple dressing options. The same base bowl transforms into something different by simply changing up the dressing. I’ll add this to next week’s meal plan for sure! Thank you, let me know what you think if you try it! Curry is the key to my heart. My friends and family may think I’m crazy but I don’t care. I eat it every chance I get! These bowls look like the bomb dot com. Curry is not crazy, I’d eat it daily too! You really stepped it up with that ginger curry dressing Sarah. I’ve seen a lot of cauli-bowls, but this one looks and sounds over the top delicious. I love what a simple, healthy meal this is! It’s perfect for Meatless Monday, or any day of the week!